I tend to watch mostly romantic comedies when I am viewing k-drama, but IRIS is a bit different. This is a decidedly action-oriented series, and while there is a little bit of romance and comedy, more than anything else this series resembles a k-drama take on the Bourne Identity. Iris is also notable because it stars Byung-hun Lee, who is currently making a crossover bid to Hollywood movies this summer with his roles in GI JOE: Retaliation and Red 2. This series also has some interesting shifts in timeline as the plot unfolds. While in my more cynical moments I might think that the circular nature of the first few episodes was designed to provide an excuse to reuse footage of an expensive location shoot, the opening of the series certainly caught my attention. A young Korean agent in Hungary is given a solo mission, and told that it is very important. We see him scouting everything out and positioning himself to carry out an assassination. He carries out his mission, killing the North Korean Prime Minister. But he’s shot by a North Korean agent as he makes his getaway! He manages to get back to his safehouse and requests assistance, only to be told that he’s on his own. All of this happens in the first eight minutes of the episode! 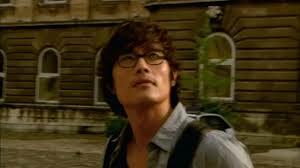 Much like Superman, Hyun Joon uses glasses to hide his true identity. Our hero is injured again in a confrontation with North Korean agents, and he passes out. The episode flashes back to the past, where we meet a slightly younger and more idiotic version of Kim Hyun Joon, training as a member of Korean Special Forces and attending college classes, where an attractive woman, Choi Seung Hee, basically makes him look stupid over and over again. Our hero is the type to relentlessly pursue any woman who seems disinterested in him, but she’s able to fend off his advances and drink him under the table. Hyun Joon trains with his best friend Jin Sa Woo aka “Second Lead Guy”. Sa Woo goes out for drinks with a man from his hometown, who brings along a beautiful female colleague, who just happens to be the student Kim Hyun Joon is crushing on. They talk, and Sa Woo also decides that he’s met his ideal woman. Sa Woo, often confused about life. Hyun Joon and Sa Woo are inducted into a secret branch of the Korean government, but not before they are subjected to some cloak and dagger shenanigans. Hyun Joon isn’t having any of that, and ends up proving his value as a secret agent due to his ability to resist the effects of mysterious injections, throw chairs against interrogation glass windows, and look like a seething badass in a wifebeater. It turns out that Seung Hee is actually an extremely gifted profiler and her interactions with the two men were part of a process to evaluate their suitability as secret agents. To make things even more complicated, Seung Hee is now their superior officer. No one to take rules about fraternization between agents very seriously, Hyun Joon pursues Seung Hee relentlessly. They have a successful first mission and take off on a secret vacation together to Japan. The blissful lovers are called back to duty though, and Hyun Joon is given the solo mission that introduced the whole series at the start of the first episode. Hyun Joon is stranded, wounded, and accused of being an enemy agent by his country and a target of North Korean agents! 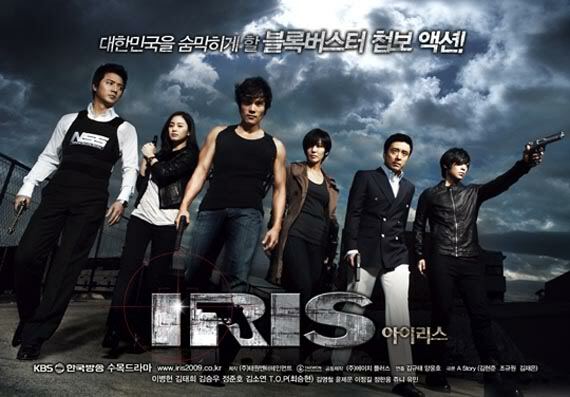 IRIS has much better production values than the typical k-drama, and the action scenes are well-directed. IRIS also inspired two related series, IRIS II, and Athena: Goddess of War. If you’re looking for an action-filled drama to enjoy over the summer, you can’t go wrong with IRIS.